Michael Rosen is a cool poet and author who has been writing poems for years. His poetry collections always have really funny titles like Lunch Boxes Don’t Fly and Mustard, Custard, Grumble Belly and Gravy. 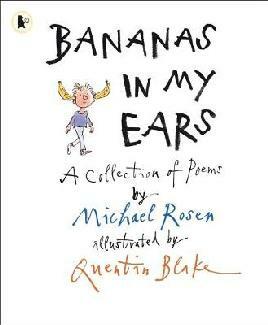 His latest collection, Bananas In My Ears, is full of weird and wonderful poems. In Bananas In My Ears there are poems about everyday life, like things that happen at breakfast time or when you go to the doctors, but there are also poems about silly things that could happen. My favourite poems in the book are called ‘What if…’ and they’re about things like ‘What if a piece of toast turned into a ghost just as you were eating it?’ or ‘What if they made children-sized diggers?’ They’re really funny and things get completely out of control in them. Each of the poems are illustrated by Quentin Blake, who you might recognize as the illustrator that did the covers and illustrations for all of Roald Dahl’s books. Poems are great to read if you don’t have alot of time to read or just want something short and Bananas In My Ears is a collection of poems you’ll want to read again and again.